Hardy only to about 10 degrees F, though winter protection can help. Where winters are mild, rosemary can grow into huge, shrub-like plants. In cold winter areas, small plants can be potted up in fall and grown through winter indoors. Beans, Cabbage, Carrot, Sage and Lavender. Start with a purchased plant, keeping in mind that growth habit varies with variety. 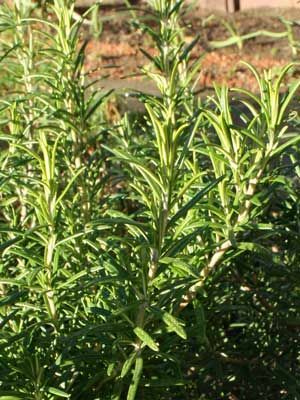 Trailing rosemary for walls, or dwarf varieties for containers, are propagated by rooting stem cuttings rather than from seeds. Wild Mediterranean rosemary can be grown from seeds or plants. Frequent pinching back helps to keep plants bushy and full, and it delays flowering. Trailing rosemary is great cascading over a wall. Gather sprigs as needed in the kitchen. Gather stems for drying from spring to late summer. Plants are often short-lived, so root stem cuttings each spring to always have vigorous young plants. Treat small outbreaks of powdery mildew with a spray made from 2 Tablespoons milk in 1 cup water.